This classic vanilla coconut flour cake is light, fluffy and delicately sweet. Its paleo, keto and the perfect healthy dessert for any occasion including birthdays, holidays and more! Preheat oven to 350°F. In a large bowl combine the egg whites and cream of tartar. Whip until stiff peaks form. Set aside. In a separate bowl, cream together honey and coconut oil with the electric mixer then add in the egg yolks and mix for the paleo version. For keto version, just lightly whip the coconut oil with the mixer, then add in the egg yolks and whip together until combined. Add in coconut flour, vanilla, baking soda and salt. Mix until combined. Fold the egg whites into the batter starting with a little bit at a time. Combine until the batter is completely mixed. Do not use a food processor or a hand blender to combine as it can affect the texture. If there are lumps after folding in the egg whites, you can use the electric mixer on the lowest setting for a few seconds to remove the lumps. It's ok if there are a few small lumps. It’s better if the mixture is a bit rough and not too smooth. Line a 6-inch mini cake pan with parchment paper or oil the pan with additional coconut oil. Pour the mixture into the cake pan. Bake for about 20 minutes. The cake is done when a toothpick is inserted and comes out clean. Using a double boiler, fill a pot with about 2 inches of water and bring to a boil. In the bowl part of the double boiler, mix all of the ingredients. Place the bowl over the pot with the heated water. Using a handheld blender, whisk the egg whites continuously until they are warm to the touch. This takes a few minutes. Your egg whites should be light & puffy. Immediately use as an icing. Even though the egg whites have been warmed they are still considered raw and should not be consumed by pregnant women, children and the elderly. If you are concerned about the egg whites being undercooked, ice the outside of the cake with the meringue and then place them under the broiler and lightly toast them. You can also use pasteurized eggs to make this icing, which means they have been lightly heated to kill bacteria, but are still uncooked. Put softened room temperature butter in a bowl. Whip with an electric mixer. Add in the confectioners sweetener gradually a little bit at a time while whipping with the electric mixer until all of the sweetener is mixed in. Add in the vanilla extract and coconut cream (or heavy cream) and blend with the mixer until smooth. Wait for the cake to cool before icing. To make a layer cake, cut the cake in half lengthwise then put frosting in the middle and stack the layers. Then frost the whole outside of the cake. To smooth the frosting, dip a knife in hot water then run it over the frosting until smooth. Don't forget to check out Indulge: 70 Grain-Free Desserts to get even more delicious grain-free dessert recipes like this one and use discount code HANNAH50 for 50% Off. This coconut flour cake recipe will make a 6-inch mini layer cake (this is the pan I used). If you prefer to make a regular sized cake with an 8 or 9-inch cake pan, you will need to double the recipe for it to fit. 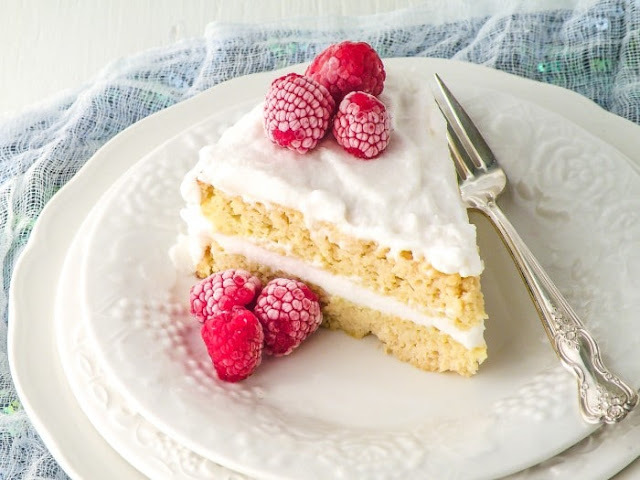 The fluffed egg whites are critical to the success of this cake since they are responsible for the light, fluffy texture while helping the coconut flour to hold together. The recipe will not work properly with any egg substitutions. The cream of tartar helps to keep the egg whites fluffy and stiff which helps the texture of the cake. If you don't have cream of tartar, the recipe will still work but you may not have quiet as fluffy of a cake. Just be sure you have fresh egg whites and beat them in a glass or metal bowl (not plastic) and be sure there is no residue from any oils in the bowl. When you add the egg whites to the dough mixture, gently fold it in. Do not use a food processor or a hand blender to combine as it can affect the texture. If there are lumps after folding in the egg whites, you can use the electric mixer on the lowest setting for a few seconds to remove the lumps. It's ok if there are a few small lumps. It’s better if the mixture is a bit rough and not too smooth. If you prefer to make the buttercream frosting with a paleo sweetener, you can use homemade powdered coconut sugar. Just grind regular coconut sugar in a coffee grinder to turn it into a fine powder, then use that in place of the powdered swerve. Just keep in mind that your frosting won't be white this way. It will be more of a brownish tan color. Nutrition Facts below are for one serving of keto coconut flour cake using swerve sweeteners. Subtract 28 grams of sugar alcohols per serving to achieve net carbs. There are 2 grams net carbs per slice of cake. 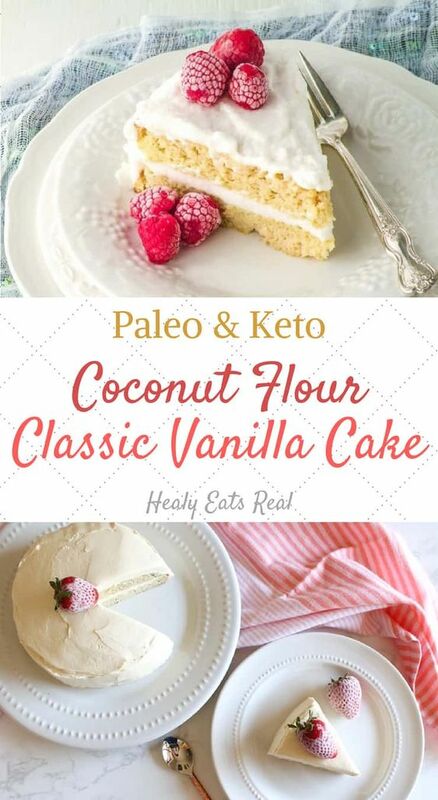 0 Response to "Classic Vanilla Coconut Flour Cake (Paleo & Keto)"